Speech Olympiad is the flagship event of the Gavel Club of University of Moratuwa, which is an affiliate of Toastmasters International. This year marks the 11th chapter of Speech Olympiad, an intra-university speech contest open to all faculties which ultimately unveils the champion speaker in University of Moratuwa. The battle began on the 14th of September 2017, as the preliminary round of the competition was held to select the top 12 competitors for the semifinals. The competitors were judged based on a 5-7 minutes prepared speech of their choice which paved the path for Asitha Rathnayake, Nadarasar Bahavan, Indeewari Chandrasekara, Kanchana Ranasinghe, Dineth Mudalige, Gunavaran Brihadiswaran, Tharindu Ranaweera, Chinthani Kumaradasa, Dulinda Perera, Malindi Jayathunga, Harshani Edirisinghe and Udesh Induwan to enter the next stage of the competition. The two reserve semifinalists were Maheka Dahanayake and Vimukthi Mayadunne. On the 23rd of September 2017, a stream of spectators gushed in to witness the semifinals of Speech Olympiad XI. This time, there was a new challenge awaiting the talented speakers as the semifinalists had to do a 5-7 minutes prepared speech as well as a 1-2 ½ minutes impromptu speech to get through to the finals. After a close battle five finalists were chosen. The above judgments were given by an esteemed panel of judges which consisted of active Toastmasters in the country. Asitha Rathnayaka (Department of Civil Engineering ), Kanchana Ranasinghe( Department of Electronic and Telecommunication Engineering), Chinthani Kumaradasa( Department of Electronic and Telecommunication Engineering), Malindi Jayathunga ( Department of Integrated Design) and Dulinda Perera ( ’17 batch, Faculty of Engineering) will be battling head to head in the finals to earn the title of the “Champion Speaker of University of Moratuwa”. The two reserve finalists were Gunavaran Brihadiswaran and Nadarasar Bahavan. A series of workshops named, “Dream Big 2017” was held in par with the Speech Olympiad XI to groom the oratory skills of the participants. TM Sandun Fernando, DTM Chathura K. Sooriya-Archchi and Celina Cramer shared their expert knowledge to provide tips and tricks of public speaking for the undergraduates to ace their speeches. This time, there’s not only one but four awards lined up for the competitors to grab! “The Champion Speaker”, “The Best Prepared Speaker”, “The Best Impromptu Speaker” and “The Most Popular Speaker”, awards will be awarded at the Grand finale which will be held on the Thursday, 12th of October, at the Civil Auditorium of University of Moratuwa. The Champion Speaker will be the overall champion of the prepared speech round and the impromptu speech round. All are welcome to witness the spectacular array of oratory eminence. Who will be that talented speaker lucky enough to get his/her name etched in the prestigious Speech Olympiad Challenge Shield this year? The stage is set; it’s high time to “Think Speak and Change”! 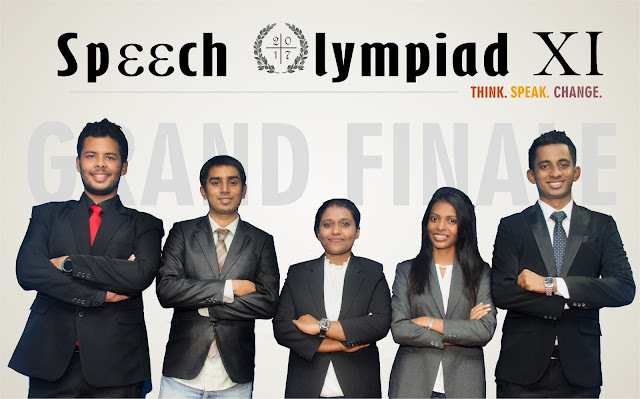 Tune into https://www.facebook.com/speech.olympiad.xi/ for the latest updates of Speech Olympiad XI.